YouTube co-founder Steve Chen, an esteemed alumnus of world-renowned Illinois Math and Science Academy (IMSA), recently returned to his alma mater to unveil the new Steve and Jamie Chen Center for Innovation and Inquiry, IN2. Designed to foster innovation among the high school students at IMSA, IN2 opens as part of IMSA's 30th anniversary celebration. "When I reflect on the pivotal points in my own journey of innovation and entrepreneurship, IMSA was among the most important," said Chen. "My years at IMSA sparked curiosity, exploration, and revealed to me all that was possible." 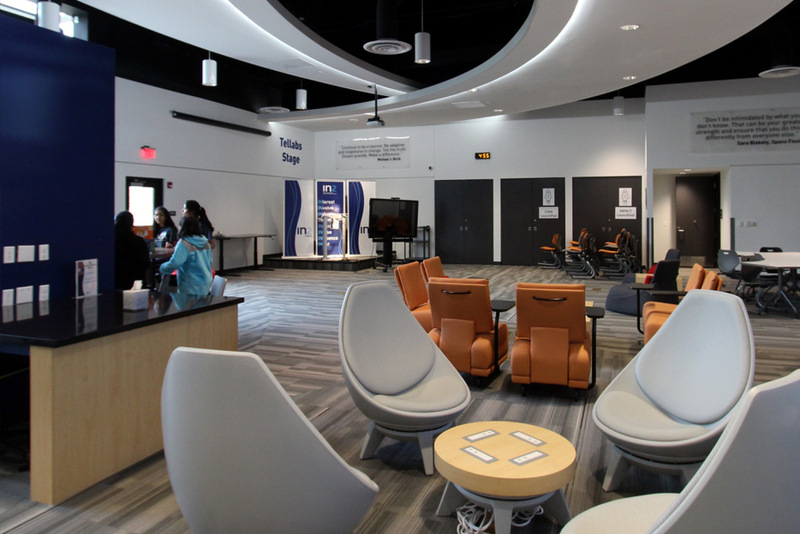 This new 6,500 square foot collaborative flexible facility and community innovation center advances IMSA as a world-leading three-year residential high school dedicated to math and science. "We are excited for the public debut of this unique and innovative center," Dr. Jose M. Torres, IMSA President said. "Our vision is to create a model for U.S. education that empowers young people to transform their ideas into reality and into solutions to the complex social challenges of our time through entrepreneurship and innovation." IMSA is a revolutionary education institution that educates approximately 650 talented Illinois 10-12th residential students and thousands of Illinois teachers and students across the state annually. Its mission is to ignite and nurture creative and ethical scientific minds that advance the human condition. Considered a world-leading teaching and learning laboratory for imagination and inquiry, IMSA creates new educational pathways for mathematics and science to advance the human condition. Steve Chen's own founding of YouTube exemplifies the spirit of this mission. Yet the IN2 Center for Innovation and Inquiry isn't limited to IMSA students. Modeled after successful entrepreneurial spaces like MIT's media lab; "1871," Chicago's Technology and Innovation Center; and the University of Illinois' EnterpriseWorks, IN2 is also a resource for civic organizations, startups, nonprofits, and businesses seeking technical solutions. Expected to become the new heart of IMSA's campus, IN2 provides vital resources for innovators looking to reshape technology. IN2 was designed by Cordogan Clark & Associates Architects working in tandem with IMSA administration, faculty, and students. Highlights include: A Makerspace with 3D printers; Learning Lab; Virtual Reality modeling stations; Idea Bar and caf? with 'Idea Baristas' who serve ideas as well as coffee; Innovation Commons; Mentoring Office; Inspiration from thought leaders ranging from Einstein to Yoda; and group collaboration spaces. Another IN2 highlight is abundant natural light. IMSA was originally designed at a time when windows and views were considered distracting to students. IN2 provided an opportunity to replace a portion of IMSA's opaque exterior with a large feature window that provides both views and natural light. IN2 contains a variety of spaces for group gatherings and instruction, seminars, private group discussions, independent study, casual meetings, and lounging. The space is designed to be flexible and active. On the ceiling, large overlapping arcs unify these various spaces to create a coherent and memorably mathematical sense of place. With its focus on STEM and innovation, IN2 provides powerful learning experiences for teen entrepreneurs, while serving as an ever-evolving model for applied teaching and learning in the 21st century. IN2 prepares students for emerging STEM fields, entrepreneurship ventures and new models of business and collaboration, and collaboration with innovation hubs in Illinois and across the country. IN2 also establishes partnerships with local thought and business leaders, currently including ComEd, Caterpillar, BP, James R. Jordan Foundation and Northern Illinois University. IN2 not only helps IMSA develop students' abilities, but also to attracting talented new students. IN2 is cutting edge, a driving factor for STEM and other students. For many students, IMSA becomes their home during the school year. Rather than spending most of their free time in their dorm rooms, IN2 offers them a modern, comfortable student center. As a new hub of student activities, IN2 serves as a place for social activities, learning, and tinkering. IN2's flexibility allows students to work in their own way. By choosing what's best for them, students are empowered over not only what they learn, but how they learn. Before attending IMSA, Steve Chen said that he had "always been, kind of spending weekends up alone for six hours, just in my own room just playing around on my computer." Yet when he arrived at IMSA as a student, he said he found out suddenly that he wasn't alone. 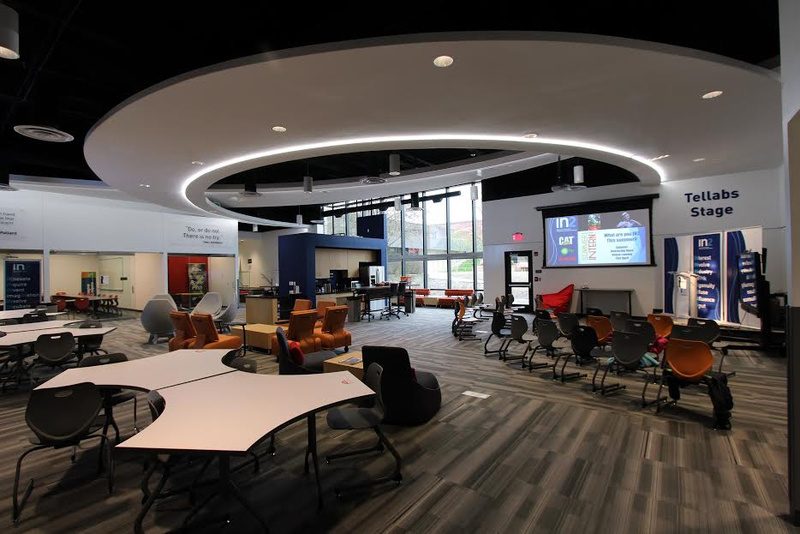 The new IN2 is not just a place for solitary thinking but also a place for community creativity that fosters student interaction, camaraderie, and teamwork to stimulate learning, thinking, and great ideas.